CuBox, the smallest computer ever, is made in Israel by an Arab-Israeli company aiming to power the Internet of Things. The 2x2x2-inch CuBox-i is the smallest computer in the world. It sells for just $55 and is made in Israel by SolidRun, a 10-person company cofounded by two Arab-Israeli electrical engineers with a background in the high-tech industry. 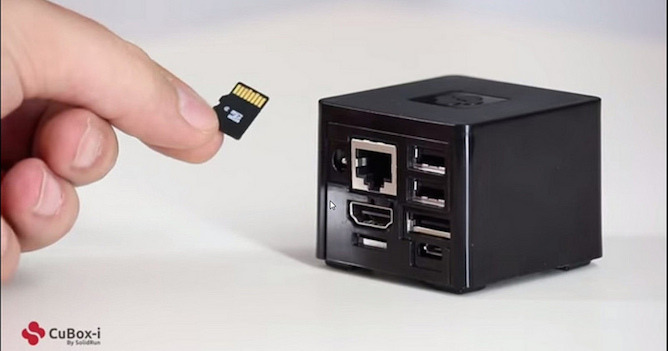 CuBox-i is the newest model from SolidRun, which launched its first CuBox low-power, miniature micro-PC and media center at the end of 2011, just a year after going into business. The tiny, yet powerful computer is not designed for tasks like word processing or photo manipulation. It’s mainly meant for the Internet of Things (IoT), among other uses. Weighing only about three ounces (91 grams) with a built-in operating system and WiFi, CuBox can be your Android TV box, multimedia streamer, networked storage solution and pocket-size personal computer, running Lite Desktop and infinite open-source applications. If you need more juice, you can scale up to the CuBox-i2 ($80) or CuBox-i4 Pro ($140) without scaling up in size. Omary, 41, and Khoury, 38, met as students at the Technion-Israel Institute of Technology. Omary was raised in Nazareth, while Khoury grew up in Tarshiha, just east of the northern coastal city of Nahariya. They did not start SolidRun until they had gained solid design and business management experience at the Israeli branches of top-flight computing and consumer electronics companies including Intel and Galileo Technology (acquired by Marvell in 2001). In late 2010, the men joined forces to bootstrap their startup, today based in the Tefen Industrial Park near Tarshiha. “We saw a world trend of computers becoming smaller and more powerful while using less power, and we also saw the trend toward digitizing,” Omary says. Now that IoT is the hottest buzzword, it is obvious that the duo’s vision was perfectly on target. They introduced their product at the right time to catch this huge wave. “IoT is a growth vehicle, and so we’re positioning the company for that,” says Omary. Home automation, for instance, requires sensors in every room for temperature and lighting, and controllers to initiate actions such as locking doors, opening shades and warming the oven. All the CuBox models, including the original version, are sold worldwide via SolidRun’s Internet site and through distributors in Europe, North America, Asia and Australia. The company is seeking its first VC funding as it looks to vastly expand its distribution network. The 10 SolidRun employees comprise five Arab Israelis and five Jewish Israelis. For more information, see www.solid-run.com or http://cubox-i.com/. Can Israel stay ahead in the global tech leadership race? Why are Israeli innovators having a huge influence on the world?